Picture from simon3 : View to the north east over arboretum. Picture: View to the north east over arboretum. The first puzzle of this hill is "Where is the top". Given the current covering in Sitka Spruce with razor wire briers I can't see any onsite determination of this at present and I am not so sure even modern technology like photogrammetry or lidar would do any better. So I think that considering the top to be beside the communications tower is unlikely to be disputable until the trees are mature or cut. A second puzzle are some of the trees nearby such as the one shown in the picture here. 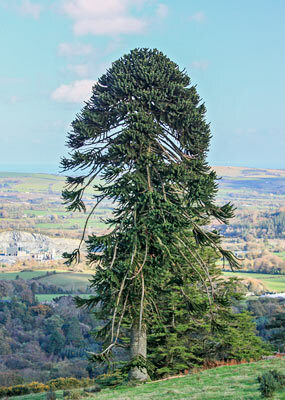 This and another are Chilean Pines, usually better known as Monkey Puzzles. "Tom Acton had a rule of thumb to plant three of every important tree or shrub. One was planted where visiting plantsmen told him it would thrive, another where he thought it would survive, and the last where it would unquestionably not survive. Examples of the latter may be seen on the brow of Westaston Hill that overlooks the house and estate. To this day, a line of exotics, like Himalayan rhododendrons, mighty North American conifers and Chilean trees, all planted by Tom Acton’s gardeners, still grow on this wind swept site. Most are in ragged order and battered because of their exposed positions – except for two fine monkey puzzles. This tree inhabits the high Andes of Chile where it is exposed to the same raging winds. In this case, a tree planted in a situation where he was told it would positively not grow, did survive, indeed it thrived." Take a look if you visit Westaston, these trees are magnificent.